Nintendo's fighting on two fronts. The first, very real battleground they're waging war on is in retail, where their Wii U home console is struggling to build a user base. The second area of struggle has been in the hearts and minds of observers trying to decide how much faith to put into the company's foresight. 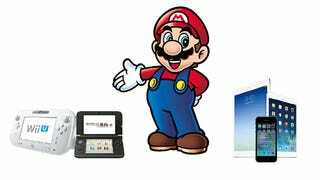 The House of Mario offered one possible answer to both conundrums: whether handheld or home console, all their hardware's going to operate under a unified vision, much like the family of Apple products. Previously, our handheld video game devices and home video game consoles had to be developed separately as the technological requirements of each system, whether it was battery-powered or connected to a power supply, differed greatly, leading to completely different architectures and, hence, divergent methods of software development. However, because of vast technological advances, it became possible to achieve a fair degree of architectural integration. We discussed this point, and we ultimately concluded that it was the right time to integrate the two teams. For example, currently it requires a huge amount of effort to port Wii software to Nintendo 3DS because not only their resolutions but also the methods of software development are entirely different. The same thing happens when we try to port Nintendo 3DS software to Wii U. If the transition of software from platform to platform can be made simpler, this will help solve the problem of game shortages in the launch periods of new platforms. Also, as technological advances took place at such a dramatic rate, and we were forced to choose the best technologies for video games under cost restrictions, each time we developed a new platform, we always ended up developing a system that was completely different from its predecessor. The only exception was when we went from Nintendo GameCube to Wii. Though the controller changed completely, the actual computer and graphics chips were developed very smoothly as they were very similar to those of Nintendo GameCube, but all the other systems required ground-up effort. The Nintendo boss also articulated how he hopes future Nintendo products will behave more like "brothers," instead of, say, cousins. However, I think that we no longer need this kind of effort under the current circumstances. In this perspective, while we are only going to be able to start this with the next system, it will become important for us to accurately take advantage of what we have done with the Wii U architecture. It of course does not mean that we are going to use exactly the same architecture as Wii U, but we are going to create a system that can absorb the Wii U architecture adequately. When this happens, home consoles and handheld devices will no longer be completely different, and they will become like brothers in a family of systems. Currently, we can only provide two form factors because if we had three or four different architectures, we would face serious shortages of software on every platform. To cite a specific case, Apple is able to release smart devices with various form factors one after another because there is one way of programming adopted by all platforms. Apple has a common platform called iOS. Another example is Android. Though there are various models, Android does not face software shortages because there is one common way of programming on the Android platform that works with various models. The point is, Nintendo platforms should be like those two examples. Whether we will ultimately need just one device will be determined by what consumers demand in the future, and that is not something we know at the moment. However, we are hoping to change and correct the situation in which we develop games for different platforms individually and sometimes disappoint consumers with game shortages as we attempt to move from one platform to another, and we believe that we will be able to deliver tangible results in the future. While this may not be the glorious, single-device future Luke Plunkett dreams of, getting all of their offerings crafted to speak the same unified language would probably create all sorts of exciting possibilities.